Experience the Fastest and Most Explosive Block-Stacking Game Ever! Even if you have not played Tetris just once in your life, chances are you have at least heard of it. The block-stacking, row-clearing puzzle game from Russia has been keeping gamers up all night for nearly 30 years now and it has shown no signs of slowing down. In fact, the opposite could not be truer. With Tetris Blitz, it’s now available to play on your Android and iOS devices, complete with a few modern changes. It’s faster than ever before, showcases more colorful visuals, and comes complete with a host of new power-ups that make it feel that much more dynamic. Tetris veterans and puzzler aficionados everywhere should find no shortage of challenge with Tetris Blitz. Tetris is and always has been a cerebral game based on speed. Blocks of various shapes periodically fall and it’s your job to arrange and stack them as efficiently as possible. In traditional Tetris, higher difficulties levels caused the blocks to fall faster, giving you precious little time to stack them properly. 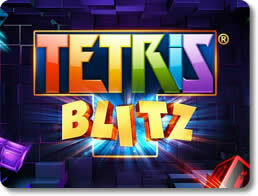 Tetris Blitz preserves most of the classic game’s principles, but revamps them in many ways to create a whole new game. Arrange the falling blocks into perfect rows to make them disappear. Tap a predestined location for the current falling block to move it to that space automatically. Clear out four rows at once to score a Tetris and earn even more points. 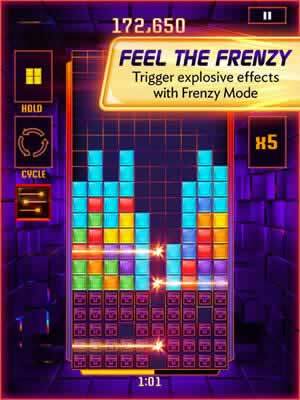 Increase your score tenfold by pulling off multiple Tetris maneuvers in a row. Take out as many rows as you can and form as many devastating combos as possible in two minutes. Tetris has always been a game that involved only you and your reflexes. There was no room for special abilities, magic spells or power-ups. Tetris Blitz changes that by including a host of powers that can make your stacking career more effective and especially flashy. Shake blocks apart with the Quake. Vaporize several lines at once with the Lasers. Increase your total amount of time with the Time Shift. Use the Magnet to shift all blocks to the left side of the screen. Call forth the Avalanche to rain an entire horde of the next block down for you. Bring in all the I-blocks you could use. Although Tetris Blitz is a single-player game, it’s not an island. There is a smattering of online features that can enhance the gameplay in a variety of ways. Post your best scores to the online leaderboards and see where you rank among players all over the world. Head on over to the in-game store to purchase the power-ups you need to improve your game. Use either virtual money that you can earn via normal gameplay or spend real money if you prefer. With Tetris Blitz, you can finally experience the beloved classic in a brand new way. In only a short amount of time, you will be able to experience the timeless gameplay with new touchscreen technology and more pizzazz thanks to the assorted power-ups. It’s not a demanding title in the least and can be experienced at no extra cost if you so choose. 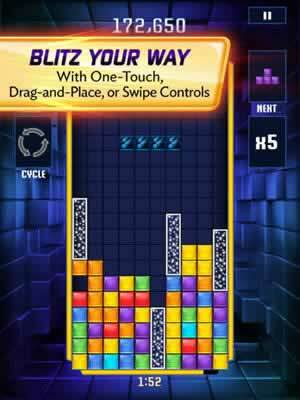 Tetris Blitz is like any good round of Tetris; all the pieces to make it a fun and unforgettable game are securely in place.